Well-known for the rich red hue of its flesh, the Blood Orange is general smaller than other varieties. 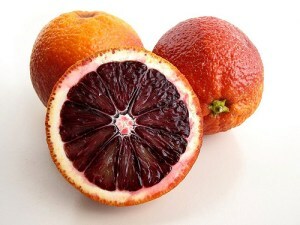 The most colorful of the blood oranges, the Moro, also has a distinct sweet flavor with a hing of raspberry, as wel as a slight bitterness and a strong aroma. The Cara Cara Orange fruit is medium-sized with a deep orange skin and reddish-pink flesh. Ripening from December through April, the Cara Cara has good Navel Orange flavor with a distinctive cranberry “twist.” Its flesh is also low in acidity and usually seedless. Created by California agronomist William Wolfskill, the Valencia Orange is rumored to have been the inspiration for the naming of Orange County, California, following their growing success in Santa Ana. Valencia Oranges are also the only variety that fruits during the summer months. The widely popular Washington Navel was actually the result of a single mutation occuring in 1820, which caused a second, smaller orange to develop at the base of the original fruit. While undoubtedly serendipitous, the nature of the Washington Navel’s creation makes it sterile, and requiring of grafting onto other Citrus varieties to continue its propagation. Predominantly cultivated in the Phillipines, the Calamondin is a cross between a citrus, and a kumquat. Generally a small growing tree — heights can reach between 9 and 19 ft, with a thin peel when fully ripe.